Please, little one, will you come out so we can finally meet face to face instead of inside to inside? So I can know what you feel like in my arms instead of just my belly (and ribcage and pelvis and hip bones…)? So your big sister can see if you look like her, if you have that special little toe like she does? So your daddy can have his full passel of girls? Please, sweet baby, will you bravely enter this world? Not just for the first time, but every time – each day when you open your eyes, when you encounter a new person, new experience, new piece of this glorious (and often heartwrenching) thing we call life? Will you love with your whole heart, and cry lustily, and be who you truly are – in each and every moment, from the very first onward? Please, sweet girl, come out and experience our love – accept it, rely on it, learn to live and walk in it and even return it someday. We are so very excited to meet you, to hold you, to show you what you mean to us. Come out, please. Come let us love you. ***photos courtesy of my darling friend Jen Olson, aka coconutbelly. Check out her amazing photo skills here and her equally lovely writing here. She’s an amazing treasure, that one. Thanks for the gorgeous shots, love! I don’t understand people who can feel crummy and still be Little-Miss-Sunshine. 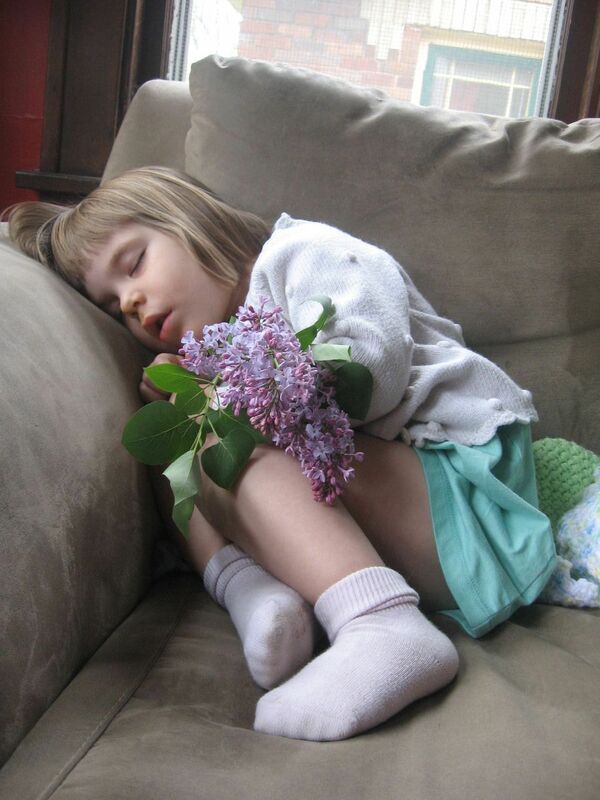 I woke up today (around 3am) with a sore throat and a stuffed up nose and feeling absolutely, disconsolately stinky…. and I must say that in this state it’s very hard to be warm, cheerful, or even sometimes just civil. Maybe I just have no reserve built up like other people do, where I’ve been stuffing extra sunshine when nobody’s looking (for just such an occasion), but I find it nearly impossible to be a human being when I’m sick. I want to crawl up into the fetal position and turn all the lights off, and keep a big pokey stick next to me to jab at anyone who ventures near to my solace. I keep seeing Meg Ryan in “You’ve Got Mail,” all confused and adorable as she’s blowing her nose on fifteen bazillion tissues and ranting in her cute-as-a-button way and I think, “Are you kidding me?! ?” Nobody is that cute when they’re sick. Especially not if they’re in the fetal position with a big pokey stick. 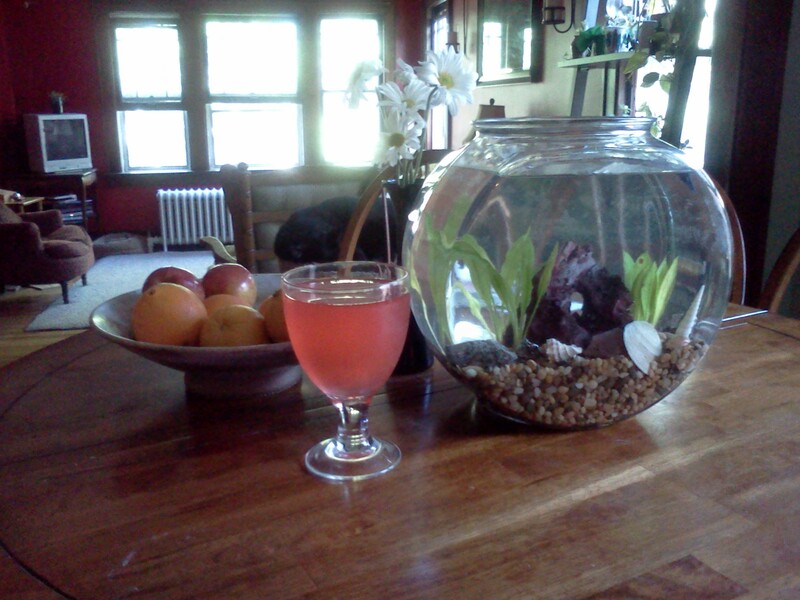 my frosty cup, alongside our new fish bowl. Oscar the betta fish hid. There’s a giant in my garden. It’s a pretty giant, and a yummy one, but it’s rather taking over… so I’ve been trolling the internets, looking for ways to use her up and cut her down to size. My new favorite: rhubarb iced tea. I came across a few different recipes in my hunting and realized it came down more to method than recipe, so I went outside, hacked some rhubarb, and made it up as I went along. And friends? It’s goooood. Olive tried some and her little face just lit up. And just look at that lovely pink color…. sigh. The perfect summer drink. Especially if you have an overgrown rhubarb plant, like me. Throw rhubarb in a pot with water. Reduce heat and simmer for about an hour. Taken whilst shopping at one of my favorite places, The Cottage House. I am officially huge – Jeff says I’ve entered “whaleness.” And that, my friends, is why I love the man. Meet my baby girl, Lila Jane Strike! 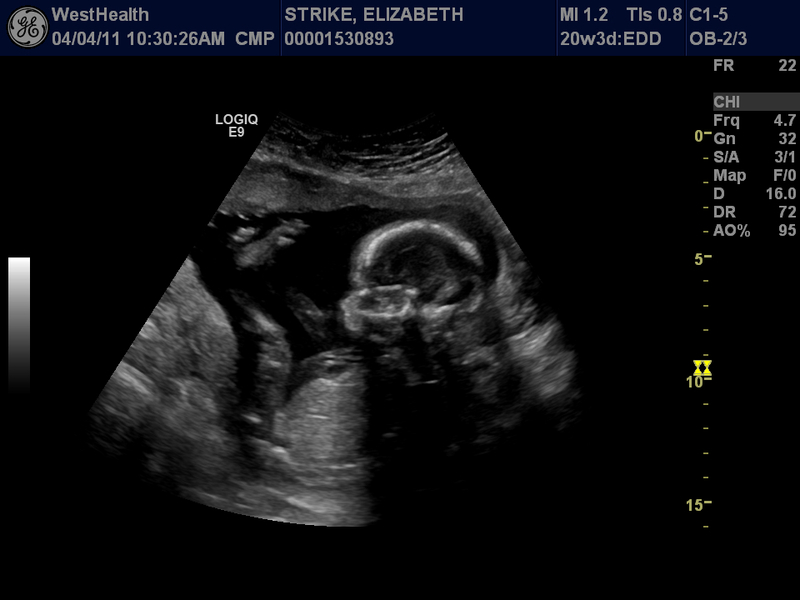 She won’t make her public appearance until late August, but here’s a shadowy image to sate you (me?) till then. And Olive also named her… almost as soon as we told her that she was going to have a little sister or brother she said, “If it’s a girl I want to name it Lila, and if it’s a boy it’s Tiger.” We quickly nixed Tiger Strike (can you imagine?!?) but Lila stuck… I’ve always loved it and Olive brought Jeff around. I’m guessing Miss O will hold that over her sister’s head for her entire life. As an older sister, I would’ve. And here I would like to throw out a heartfelt thank you to everyone who is math, science & tech gifted and who works to make things like this possible – that I could go into a dim room, have goo & a plastic thingamabob rubbed on my belly and then – as if by magic – see my baby girl wriggle and yawn and live, is absolutely amazing. Thank you, thank you, thank you to the people who make such things happen. You rock. I am today 20 weeks pregnant with Strike 2 (and our ultrasound is Monday… can’t wait to find out if it’s a he or a she that’s been kicking me in the… well, everything!). Exciting!!! But here’s the thing for me: pregnancy stinks. Notice I said “for me” – I know other women feel amazing, live in constant awe of the process and relish every moment of their babymaking experience. It doesn’t work that way for me. I’m constantly exhausted, ill every day, struggling against depression, and grappling with a myriad of other unsavory side effects of growing this little person. I love it for what it is – the creation of life – and I cannot wait to meet the magnificent little creature coming together as I write. I did choose this, after all, even this time knowing what I would be in for. I know there are ladies who would kill to be in my position and I honor their desire, their longing, their space – but it doesn’t make it any easier for me when I’m praying to the porcelain god for the fifth time today, feeling as though it will never end and I can’t possibly take care of my family in the midst of it. I’m still wretched, even if it’s laced with happiness. What I’m doing now is trying to relax into these harder times. I can feel so desperate, so overwhelmingly helpless at times, so clenched-up frustrated – but I’m learning that if I can unclench, if I can lean into it – there’s space. It’s almost like the moment expands to hold me, my darkness, and just a little extra, too – enough extra room that something else can be born and held, too – some peace, some calm, some serenity. Right up there next to the yuck. And then it’s all okay. I can make it through. Our tree is, as I like to call it, a mutt tree. It’s covered in the mishmash of our history, in every color under the sun, randomly hung with the love one can only give a beloved family mutt. 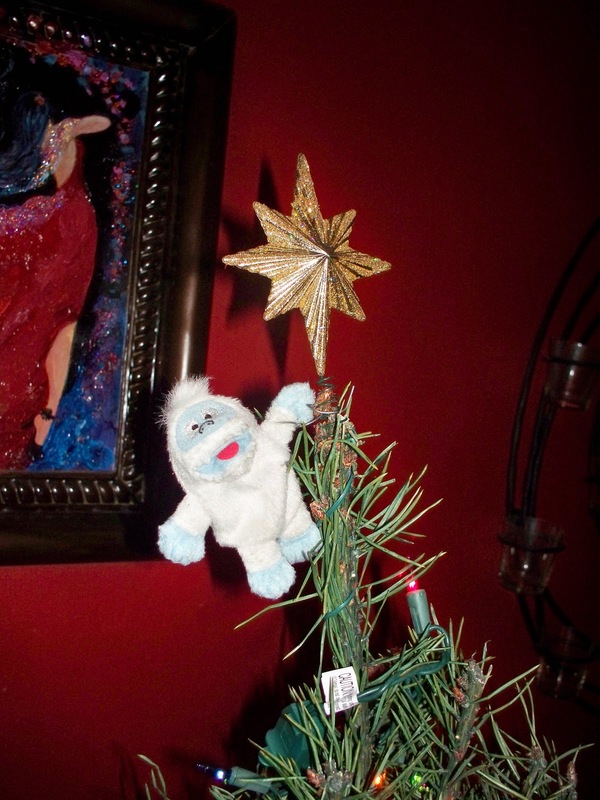 Instead of a tree topper we have a star being clung to by the Abominable Snowman – Jeff & I found him our first year of marriage and he’s now an indispensible honored guest. 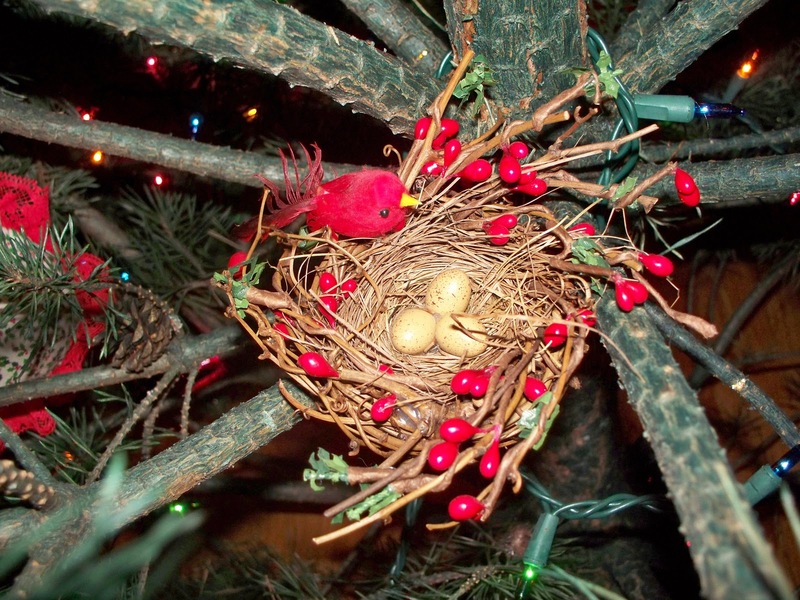 Inside, near the trunk of the tree, is nestled a teensy bird’s nest inhabited by a sweet little red bird and her eggs, simply because in my mother’s family it is a tradition to have a nest in the tree. There’s a walnut shell painted like a strawberry and a cookie Santa head, made in my extreme youth. There are random plastic icicles, vestiges of my childhood tree that I am fiercely protective of. There’s a brass angel from the year of my birth, engraved with “Beth, 1977” because my parents were still convinced that I would be called Beth at that point in my young life. 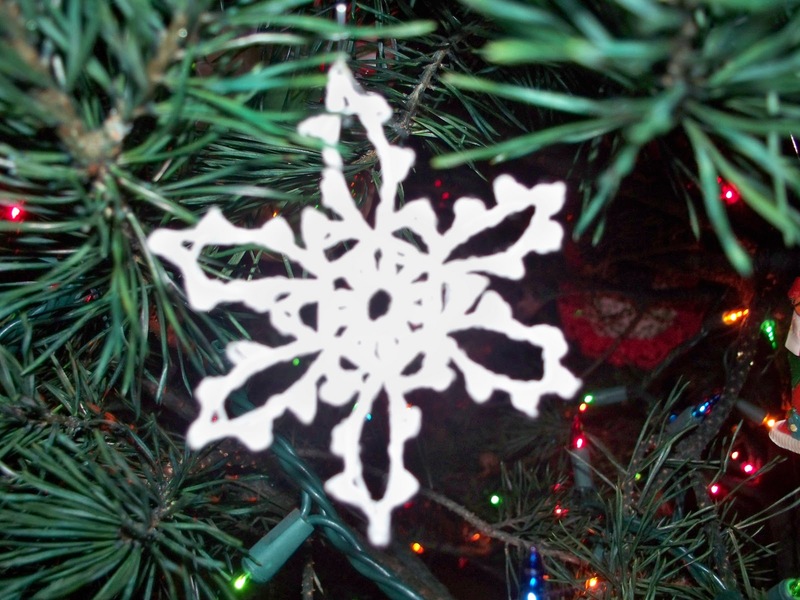 My mother had a tradition of making (or, occasionally, buying) an ornament for each of us four kids each year. Then, when we grew up and flew the coop, we were presented with a box of all 18 ornaments, plus the ones we had made or been given over the years. I still get misty every year when I open that shoebox and relive the memories of each one – and I can still tell the stories. 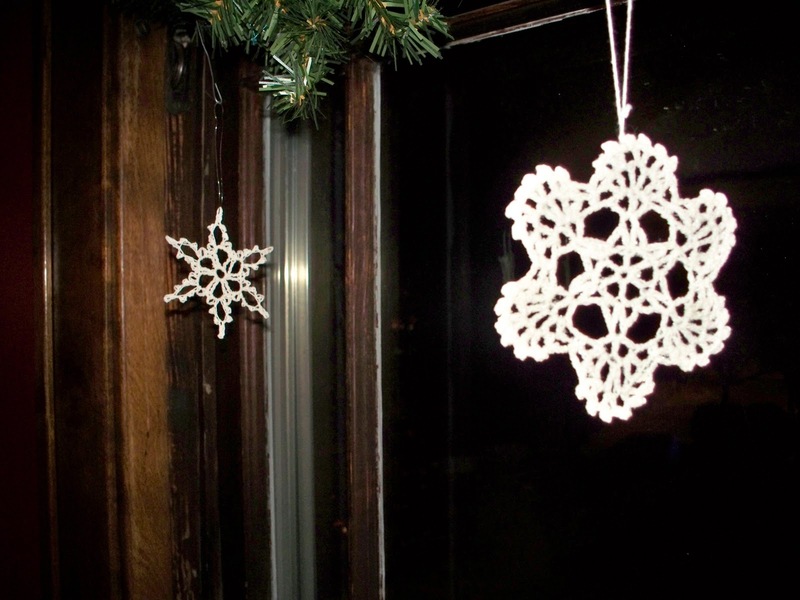 Yet, despite all these beautiful relics of earlier versions of me the thing I think I treasure the most is something a little newer, a little less family oriented, a little more ordinary – or extraordinary, depending on how you look at them: a collection of hand sewn & starched snowflakes. On September 11th, 2001, I boarded a plane in Baltimore and flew to Detroit for a quick stopover on my way home to San Diego. We reboarded, taxied to the runway, and sat. And sat. And returned to the terminal, where all the televisions were turned off. There were frightened phone conversations, and then we all crowded into the bar to watch, on the only TV available, planes crash into the Twin Towers. 23, unemployed, I was heading home from a visit to a dear old friend with nothing but change in my pocket. I had wisely left my credit cards at home so I couldn’t spend more than my budget – which I had, of course, spent in full. I had no cell phone, no computer, no way to contact my family who knew only that I was flying from the East coast to the West coast that morning. I was terrified. I sat down, alone and penniless, sobbing. Two women were immediately at my side – two women who, when sitting next to me, looked like they could have been my mother and grandmother. Mary and Sadie. They stayed with me all day, as the airlines brought us lunch and offered us toiletry kits. They paid for my phone call to my mother to assure her I was alive. They rode with me to the hotel the airlines provided free that night and were my roomies, washing our underwear in the sinks and sleeping rolled up in sheets since they wouldn’t give us access to our luggage. They paid for my meals and the hotel the next night, and waited in endless lines with me as we attempted to get to San Diego. They watched endless CNN with me and we railed together against commentators who said impossibly offensive things. For three days, until we made it to Southern California, those two ladies were my family. Mary, my pseudo mom, was from Buffalo and was headed to San Diego to see an ailing aunt. Sadie was a north county San Diegan. I talked to them both within hours of getting home – checking in, laughing over how good it felt to FINALLY have our luggage and clean clothes. I sent them both thank you cards and some money to cover what they had spent on me over the three day ordeal. And then there was silence. That Christmas a card arrived from Mary, stuffed to the brim with gorgeous lace snowflakes she had made herself – because that was the only snow I would get that Christmas, she said. She wanted me to have a little white in my holiday. For the next few years, I would get a card from Mary each September 11th with a pressed pansy inside – for remembrance, she said. 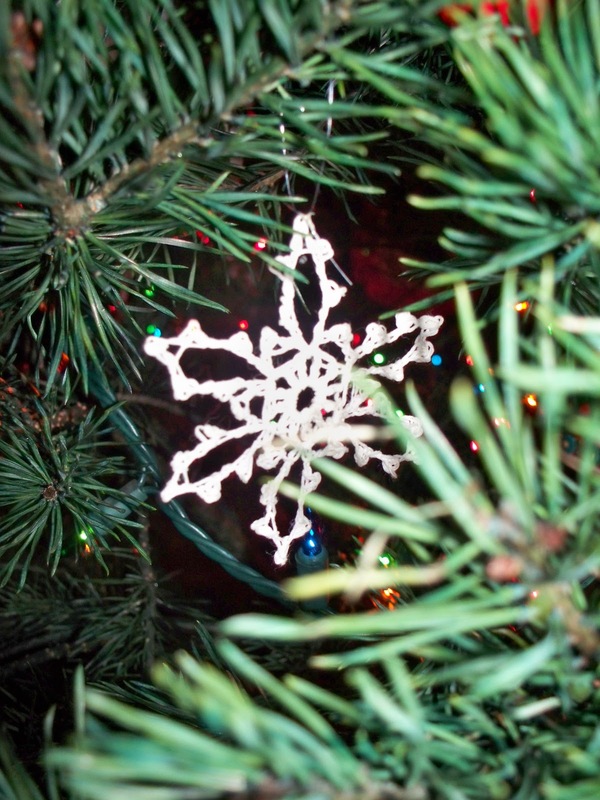 But what brings her to mind the most – what reminds me of the whole thing, the planes and the fear and the community and the hope and the love – is the sight of those snowflakes on my tree, hanging in my window, pretending to fall. I don’t know where Mary is now, or Sadie either.